Save an extra CDN$ 14.96 (50%). Buy the Kindle Edition instead. Start reading How to Feed a Family: The Sweet Potato Chronicles Cookbook on your Kindle in under a minute. LAURA KEOGH and CERI MARSH, former Fashion magazine editors, traded the fast-paced world of fashion for the even faster, more frantic pace of parenthood. Leaving behind stilletos and cocktails, for spatulas and kale, the pair teamed up to create www.sweetpotatochronicles.com, a website dedicated to providing inspiration and information for parents looking to create healthy lifestyles for their families. Keogh and Marsh live in Toronto, ON, with their husbands and children. The author lives in Toronto, ON. 5.0 out of 5 starsGood food!!! I love this cookbook! Every recipe I have tried has received a verdict of "yum!" from my 4-year-old, and delicious for my husband and I as well. Very happy to have some new ideas to expand our repertoire beyond cheese pizza and cheesy noodles! Thanks Ceri & Laura! You've made mealtime much more enjoyable in our home. I love this book! There are so many recipes that I've tried and the kids have loved all of them. Great ideas and easy to follow recipes. Nothing too fancy, most ingredients are on hand. This has quickly become my go-to recipe book. All recipes tried to date are great. Recipes in this are great, simple and healthy. Just not ones that will even halfway appeal to my pickiest of picky kids. I guess I misunderstood what I read before ordering the book, hoping that the strategies promised for dealing with pickiness were more useful than all of the countless tried and died cliches I've read or had suggested to me since my boys started eating solids years ago. Sadly, out of this whole lovely book, only about 4 recipes will fly in is family...for now...Gonna keep the book for when/if they ever pass through this "phase"! Or for nights when we can pawn them off on family and have a stay at home date night\morning. 5.0 out of 5 starsFantastic Cook Book! 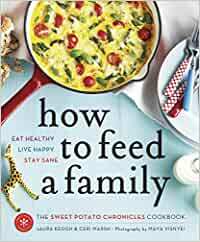 Not only is this a fabulous cook book with simple straight forward recipes to make with the family for the family, it is gorgeous! I keep mine on our coffee table for display. The pictures are lovely and colourful. It is also enjoyable to read. Both Ceri Marsh and Laura Keogh have a great sense of humour that is expressed through their writing. I never thought a cookbook could be so much fun! I've tried about 5 recipies so far and i've been very disappointed each time. it may be healthy but it has to be enjoyable as well and these weren't.